Because “one size doesn’t fit all” when it comes to professional development, HMH and Math Solutions offer school districts different levels of professional development designed to complement Do The Math, Do The Math Now!, and Math Reads. Teachers learn to implement the instructional strategies, while deepening their understanding of the importance of focus, structure, and coherence and how they apply to delivering effective instruction. These full-day trainings give teachers the foundational support they need to implement these programs in their classrooms. 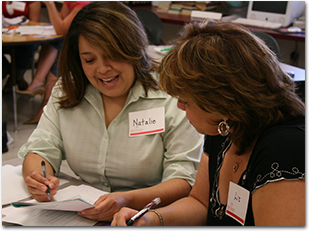 This training helps teachers get started using Math Reads in their classrooms by focusing on the appropriate grade-level books and instructional strategies aligning the books with related lessons. These in-classroom visits provide teachers with customized coaching support for ongoing classroom management, program monitoring, and data-driven instruction, in order to ensure long-term implementation success. 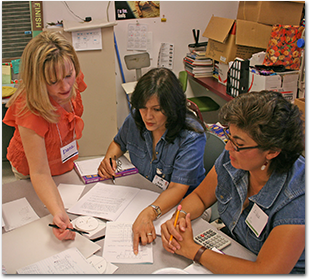 These two-day foundational seminars help teachers gain a deeper understanding of instructional strategies and underlying mathematics content.